Hospitals with 95% CIs below 1.0 represent low outliers (better performance), hospitals with 95% CIs above 1.0 represent high outliers (worse performance), and all other hospitals are designated average. Circles represent individual hospitals; error bars, 95% CIs. Hospitals (circles) are ranked by better (lower rank number) to worse (higher rank number) performance for each of the 6 studied outcomes. With thyroidectomy-specific variables indicates hospital rank when thyroidectomy-specific variables were available for risk adjustment; without thyroidectomy-specific variables, hospital rank when thyroidectomy-specific variables were unavailable. Pearson correlation coefficient (r) was calculated to assess the degree of discordance in rank. Reference line represents y = x. Hospitals located on the reference line represent no change in rank with the inclusion of thyroidectomy-specific variables for risk adjustment. Hospitals located above the reference line are those that had worse performance when thyroidectomy-specific variables were included for risk adjustment, whereas hospitals located below the line had improved performance when thyroidectomy-specific variables were included for risk adjustment. Cohen ME, Ko CY, Bilimoria KY, et al Optimizing ACS NSQIP modeling for evaluation of surgical quality and risk: patient risk adjustment, procedure mix adjustment, shrinkage adjustment, and surgical focus. J Am Coll Surg.2013;217(2):336-346, e331. Chesapeake IRB. 2017; https://www.chesapeakeirb.com/. Accessed July 5, 2017. Iezzoni LI. Risk Adjustment for Measuring Health Care Outcomes. 4th ed. Chicago, IL: Health Administration Press; 2013. Allison P. Handling Missing Data by Maximum Likelihood. Haverton, PA: Statistical Horizons; 2012. SAS Global Forum 2012. Statistics and Data Analysis. Paper 312-2012. Burdick RK, Graybill FA. Confidence Intervals on Variance Components. New York, NY: M Dekker; 1992. What Can Thyroidectomy-Specific Outcomes Teach Us About ACS-NSQIP? Question Can thyroidectomy-specific outcomes be used for national hospital quality improvement metrics? Findings This cohort study detected significant variation in hospital performance after thyroidectomy for hypocalcemia and recurrent laryngeal nerve injury but not for hematoma. 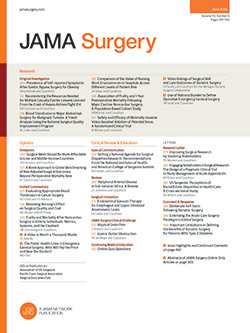 Whether thyroidectomy-specific variables were used for risk adjustment did not substantively affect hospital rankings; however, compared with the worst-performing hospitals, the best-performing hospitals more frequently used intraoperative nerve monitoring and energy devices and prescribed oral calcium or vitamin D supplement at discharge. Meaning Hypocalcemia and recurrent laryngeal nerve injury, but not hematoma, after thyroidectomy may be used as national hospital quality improvement metrics. Importance Current surgical quality metrics might be insufficient to fully judge the quality of certain operations because they are not procedure specific. Hypocalcemia, recurrent laryngeal nerve (RLN) injury, and hematoma are considered to be the most relevant outcomes to measure after thyroidectomy. Whether these outcomes can be used as hospital quality metrics is unknown. Objectives To evaluate whether thyroidectomy-specific outcomes vary among hospitals, whether the addition of thyroidectomy-specific variables affects risk adjustment, and whether differences in hospital performance are associated with thyroidectomy-specific care processes. Design, Setting, and Participants In this retrospective cohort study, patients undergoing thyroidectomies from January 1, 2013, through December 31, 2015, at hospitals participating in the American College of Surgeons’ National Surgical Quality Improvement Program were studied. Main Outcomes and Measures Clinically severe hypocalcemia, RLN injury, and clinically significant hematoma within 30 days of thyroid surgery and hospital-level performance variation, change in risk adjustment, and association with processes. Results Overall, 14 540 patients (mean [SD] age, 52.1 [15.0] years; 11 499 [79.1%] female) underwent operations at 98 hospitals. Because operations missing thyroidectomy-specific outcomes were excluded, the numbers of operations and hospitals analyzed differed by outcome. Of 14 540 operations included, clinically severe hypocalcemia occurred in 450 patients (3.3% overall, 0.6% after partial, and 4.7% after subtotal or total thyroidectomy), RLN injury in 755 patients (5.7% overall, 4.2% after partial, and 6.6% after subtotal or total thyroidectomy), and hematoma in 175 patients (1.3%). Hospital performance varied for hypocalcemia and RLN injury but not for hematoma. Hospital performance rankings were largely unaffected by the inclusion of thyroidectomy-specific data in risk adjustment. With regard to processes, patients undergoing thyroidectomies at the best-performing vs worst-performing hospitals less frequently had their postoperative parathyroid hormone level measured (593 [19.9%] vs 457 [31.7%], P < .001) and more often were prescribed oral calcium, vitamin D, or both (2281 [76.6%] vs 962 [66.8%], P < .001). When profiled by RLN injury, use of energy devices (1517 [69.1%] vs 507 [55.2%], P < .001) and intraoperative nerve monitoring (1223 [55.7%] vs 346 [37.7%], P < .001) were more prevalent at the best- compared with the worst-performing hospitals. Conclusions and Relevance Postoperative hypocalcemia and RLN injury, but not hematoma, potentially could be used as thyroidectomy-specific national hospital quality improvement metrics. Strategies aimed at reducing these complications after thyroidectomy may improve the care of these patients. Outcomes such as mortality and surgical site infections (SSIs) are broadly applicable for surgical quality improvement across all procedures. However, measuring procedure-specific outcomes may be necessary to advance surgical quality improvement in some realms. Recognizing that certain procedures have unique processes and outcomes that deserve more specificity and granularity, the American College of Surgeons’ National Surgical Quality Improvement Program (ACS-NSQIP) augmented its core program with the option to collect procedure-specific data. More than 70 000 thyroidectomies are performed annually in the United States.1-3 Because complications, such as mortality and SSIs, are rare after thyroidectomy, many consider hypocalcemia (ie, hypoparathyroidism), recurrent laryngeal nerve (RLN) injury, and cervical hematoma to be the most relevant complications after thyroidectomy.4 Permanent hypocalcemia reportedly occurs in up to 3% of patients after their operation,5 RLN injury in 3% to 11%,6 and hematoma in 2%.7 These outcomes are vital in thyroid surgery, having direct implications for postoperative care, resource use, and patient quality of life. Furthermore, certain care processes, such as the use of intraoperative nerve monitoring (IONM)8 or measuring perioperative serum parathyroid hormone (PTH) levels,9 are thought by many experts to influence postthyroidectomy outcomes. In January 2013, the ACS-NSQIP launched a thyroidectomy-specific module to support measurement of factors, processes, and outcomes for quality improvement purposes. It remains unclear whether thyroidectomy-specific outcomes can feasibly be used for hospital performance improvement. Using these novel thyroidectomy-specific data from the ACS-NSQIP, our objectives were to evaluate (1) whether thyroidectomy-specific outcomes vary among hospitals, (2) whether the addition of thyroidectomy-specific variables affects risk adjustment, and (3) whether thyroidectomy-specific processes of care are associated with differences in hospital performance. This cohort study included thyroidectomies performed at ACS-NSQIP hospitals from January 1, 2013, through December 31, 2015 (eAppendix in the Supplement). The ACS-NSQIP data collection and validation processes have been previously described.10-12 In brief, dedicated, trained surgical clinical reviewers collect patient characteristics, operative details, and postoperative outcomes following standardized definitions within 30 days of the index operation irrespective of patient discharge status. Data are obtained from the medical record, through discussions with treating physicians, and, when necessary, by contacting patients directly. Data collected are adherent with the Health Insurance Portability and Accountability Act and are routinely audited. Because this study analyzed preexisting, deidentified data, the Chesapeake Institutional Review Board13 deemed it exempt from oversight; therefore, no informed consent was necessary. Three thyroidectomy-specific outcomes (hypocalcemia, RLN injury, and hematoma) and 3 standard ACS-NSQIP outcomes (morbidity, SSI, and readmission) were studied. Clinically severe postoperative hypocalcemia was deemed to have occurred if the patient was evaluated in the emergency department or in an office setting because of signs and symptoms potentially related to low calcium levels; was admitted to a health care facility for the signs, symptoms, or treatment of low calcium levels; or was prescribed intravenous calcium. Injury or dysfunction of the RLN occurred if there was evidence of persistent hoarseness or vocal cord dysfunction beyond the first postoperative day. This timeframe was chosen to minimize the misclassification of patients who have soreness or hoarseness immediately after extubation from endotracheal anesthesia. Clinically significant postoperative hematoma occurred if a patient developed a cervical hematoma that resulted in increased length of stay, readmission, or intervention (eg, open evacuation, bedside aspiration). Standard ACS-NSQIP outcomes included morbidity, SSI (superficial incisional, deep incisional, or organ/space), and unplanned readmission (eAppendix in the Supplement). Standard ACS-NSQIP variables (patient demographics, comorbidities, and laboratory values) and thyroidectomy-specific variables were considered for risk adjustment. Thyroidectomy-specific variables included operative indication (single nodule or neoplasm, multinodular goiter, Graves disease, differentiated malignant tumor, poorly differentiated malignant tumor, other malignant tumor, or other indication), presence of thyrotoxicosis, and prior anterior neck surgery. Available intraoperative and postoperative information was also considered: whether an alternative exposure approach (eg, robotic) was used, whether a central neck dissection was performed, and whether parathyroid autotransplantation was performed. For malignant tumors, multifocality (multifocal and unilateral, multifocal and bilateral) and American Joint Committee on Cancer’s Cancer Staging Manual, seventh edition, pathologic TNM classification were incorporated. Because care processes might reflect differences in hospital performance, they were not considered for risk adjustment.14 Instead, 7 thyroidectomy-specific care processes were examined to generate hypotheses about whether their use was associated with hospital performance differences: (1) preoperative needle biopsy performed, (2) an energy device (eg, LigaSure, Harmonic) used, (3) IONM used, (4) surgical drain placed, (5) serum calcium or (6) PTH levels measured before discharge, and (7) patient given oral calcium or vitamin D replacement during the hospital stay or discharged with these medications. Continuous variables were compared using the 2-tailed, unpaired t test. Pearson χ2 test for association or Fisher exact test was used to compare categorical variables, when appropriate. In accordance with standard ACS-NSQIP processes, missing data were imputed using maximum likelihood estimation.15 Operations missing thyroidectomy-specific outcomes were excluded from analyses. All tests of statistical significance were 2-sided with α = .05. SAS statistical software, version 9.4 (SAS Institute Inc) was used. Because thyroidectomy-specific variables also might affect hospital performance on standard ACS-NSQIP outcomes, we repeated these analyses using morbidity, SSI, and readmission as outcomes. In sum, 12 models were constructed (3 thyroidectomy-specific outcomes with thyroidectomy-specific variables and 3 without and 3 standard outcomes with thyroidectomy-specific variables and 3 without). Third, we compared the frequency of certain processes of care between the best- and worst-performing hospitals to examine whether differences in hospital performance appeared to be associated with certain thyroidectomy-specific care processes. Hospitals were sorted into deciles, such that hospitals in the first decile represented the best-performing hospitals and those in the 10th decile represented the worst. Frequencies of thyroidectomy-specific care processes were compared between these 2 performance deciles. Overall, 14 540 patients (mean [SD] age, 52.1 [15.0] years; 11 499 [79.1%] female) underwent operations at 98 hospitals. Because operations missing thyroidectomy-specific outcomes were excluded, the numbers of operations and hospitals analyzed differed by outcome. There were 13 242 operations with complete hypocalcemia data, 13 144 operations with complete RLN injury data, and 13 197 operations with complete hematoma data. These numbers represented 96 hospitals (median hospital case volume, 89.5; interquartile range [IQR], 20-183) profiled by hypocalcemia, 95 hospitals (median case volume, 92; IQR, 20-187) by RLN injury, and 95 (median case volume, 93; IQR, 20-188) by hematoma. Clinically severe hypocalcemia occurred in 450 patients (3.3% overall, 0.6% after partial, and 4.7% after subtotal or total thyroidectomy), RLN injury in 755 patients (5.7% overall, 4.2% after partial, and 6.6% after subtotal or total thyroidectomy), and hematoma in 175 patients (1.3%) (eTable 1 in the Supplement). Significant patient- and thyroidectomy-specific factors associated with clinically severe hypocalcemia, RLN injury, and clinically relevant hematoma are given in Table 1. Renal failure and extensive operations were positively associated with hypocalcemia, whereas older age was protective. Larger tumors were associated with developing RLN injury. Having an elevated preoperative hematocrit, bleeding disorder, or contaminated wound was associated with postoperative hematomas; no thyroidectomy-specific factors were selected during the model-building process. eTable 2 in the Supplement reports factors associated with thyroidectomy-specific outcomes when thyroidectomy-specific variables were unavailable. Using thyroidectomy-specific variables, hospital performance varied for hypocalcemia and RLN injury, as reflected by outliers in Figure 1A and B and Table 2. When profiled by hypocalcemia, 4 hospitals were low and 7 were high outliers (median risk-adjusted OR, 0.95; range, 0.29-6.42) (Figure 1A). When profiled by RLN injury, 8 hospitals were low and 14 were high outliers (median risk-adjusted OR, 0.98; range, 0.16-18.2) (Figure 1B). No significant variability was found in between-hospital performance for hematoma (Figure 1C). With use of thyroidectomy-specific variables, performance among hospitals also varied for standard ACS-NSQIP outcomes of morbidity (Figure 1D) and SSI (Figure 1E), although there were still few outliers (Table 2). No between-hospital variability for readmissions (Figure 1F) was detected. Figure 2 depicts the result of profiling hospitals with and without thyroidectomy-specific variables available for risk adjustment across all outcomes studied. Changes in hospital rankings were largely unaltered across the outcomes; Pearson correlation coefficients ranged from 0.99 to 1.00 (all P < .001), reflecting near-perfect correlation. Table 2 also indicates how the availability of thyroidectomy-specific variables for risk adjustment influenced hospital outlier status. Of 6 outcomes, only hypocalcemia and RLN injury had any influence; for the other outcomes, thyroidectomy-specific adjusters had no influence. Status changed for only 4 hospitals when profiled by hypocalcemia and RLN injury, and in no case did a hospital move farther than the adjacent class. For example, when profiled by hypocalcemia without thyroidectomy-specific variables available for risk adjustment, 10 hospitals were deemed to be high outliers; however, when thyroidectomy-specific variables were available, 3 of these hospitals became average, whereas 7 remained high. No hospitals changed from high to low or low to high. Agreement in hospital rank was near complete (weighted κ range, 0.82-1.00, when available). Inclusion of thyroidectomy-specific variables had minimal influence on model fit statistics (eTable 3 in the Supplement). To explore whether certain thyroidectomy-specific care processes were associated with differences in hospital performance, Table 3 presents the results of patients undergoing thyroid surgery at hospitals in the highest decile (worst performing) compared with those in the lowest decile (best performing). Because no hospital variability was detected for hematomas, care processes were not explored for this outcome. These associations are not assumed to be causal and were interrogated to provoke thought only. With regard to hospital performance on postoperative hypocalcemia, differences were not associated with whether postoperative calcium levels were measured (best-performing vs worst-performing hospitals, 71.0% vs 68.4%; P = .09). However, patients who underwent thyroidectomies at the best-performing hospitals less frequently had their postoperative PTH level measured compared with those who underwent their thyroidectomies at the worst-performing hospitals (593 [19.9%] vs 457 [31.7%], P < .001). Patients who underwent thyroidectomies at the best-performing hospitals were more often prescribed postoperative calcium, vitamin D, or both compared with those at the worst-performing hospitals (2281 [76.6%] vs 962 [66.8%], P < .001). With respect to RLN injury, IONM (1223 [55.7%] vs 346 [37.7%], P < .001) and energy devices (1517 [69.1%] vs 507 [55.2%], P < .001) were more frequently used at the best-performing hospitals compared with the worst. The first objective of this study was to evaluate whether thyroidectomy-specific outcomes vary among hospitals. Current quality metrics might be insufficient because they are not adequately procedure specific. Using thyroidectomy-specific ACS-NSQIP data, we detected significant hospital performance differences for clinically severe postoperative hypocalcemia and RLN injury but not for clinically significant cervical hematoma. When hospitals were evaluated based on standard ACS-NSQIP outcomes, hospital performance varied significantly for morbidity and SSI (although with few outliers) but not for readmission. These results suggest that continued quality improvement efforts that target hypocalcemia, RLN injury, morbidity, and SSI after thyroidectomy are warranted. The second objective was to assess whether adding thyroidectomy-specific variables to standard ACS-NSQIP variables affects risk adjustment on hospital rankings. Risk adjustment helps ensure that fair comparisons are made among hospitals by accounting for immutable patient factors outside the surgeon’s control and improves insight into improvement targets.14 No substantive changes in hospital rankings when thyroidectomy-specific data were included in the risk adjustment process were found. The thyroidectomy-specific data, as currently implemented, did not provide additional statistical explanatory power beyond variables currently routinely collected in the ACS-NSQIP for hospital-level performance measurement.16,17 Therefore, risk adjustment using currently collected ACS-NSQIP data are acceptable when comparing hospitals by thyroidectomy-specific and standard outcomes, but potential for improvement remains. New thyroidectomy-specific variables with more explanatory power are needed (eg, prior anterior neck irradiation, concomitant parathyroidectomy for primary hyperparathyroidism), or current thyroidectomy-specific variables require revisions (eg, assess outcomes beyond 30 days). When profiled by risk-adjusted RLN injury occurrences, the best-performing hospitals—or, more precisely, surgeons at these hospitals—more frequently used energy devices and IONM compared with the worst-performing hospitals. Benefits of IONM include improved identification of RLN anatomy and immediate intraoperative assessment of RLN function.8,24 However, whether the use of IONM is associated with decreased rates of RLN injury compared with direct visualization or whether intraoperative signal loss indicates postoperative vocal cord dysfunction remains controversial.6,25,26 In this study, the use of IONM was associated with improved hospital performance. Data on whether the RLN was directly visualized intraoperatively and whether an IONM signal was present at the end of the operation were unavailable and thus could not be assessed.27 These and other data might be needed to better understand these findings. Surgeons at hospitals with the lowest aggregate (ie, hospital) rates of RLN injury more frequently used energy devices. Although it might be counterintuitive that energy device use is protective, bias could exist. The effect of energy devices on outcomes remains ambiguous.28-31 Hospitals with surgeons who more commonly use IONM might simply have more resources and thus more availability of energy devices.32 Alternately, perhaps surgeons who on average have superior outcomes are more attuned to these technology investments and their limitations. Care processes such as those studied are generally more attributable to the surgeons, and higher-quality hospitals may reflect higher-quality surgeons. These data could not directly examine how individual surgeon care practices and performance affect overall hospital performance on these outcomes. Those insights should be pursued in future work. Other limitations must be recognized. This study’s definition of RLN injury is more inclusive than the criterion standard of directly examining postoperative vocal cord function, and our results might represent overestimations. The current data were the first iteration of thyroidectomy-specific data collection in the ACS-NSQIP, and a relatively small cohort of hospitals (approximately 13%) participated. Therefore, the generalizability of our findings to non–ACS-NSQIP hospitals might be limited. Many hospitals in this cohort were academic institutions with high thyroidectomy volumes. Although this mitigates concerns about the influence of unmeasured volume-outcome variables,35 homogeneity might explain the lack of detectable performance variation in postoperative hematomas. However, we can expect wider performance variation for hypocalcemia and RLN injury with the inclusion of additional, less expert hospitals, suggesting that thyroidectomy-specific outcomes are more important to measure for quality improvement purposes. In the ACS-NSQIP, collected data and variable definitions are continuously reviewed and revised with input from participants and experts. Subsequent iterations of thyroidectomy-specific data collection rely on analyses such as these to make improvements. Short-term, clinically severe hypocalcemia and RLN injury, but not hematoma, after thyroidectomy may be valuable quality improvement metrics. The detectable performance differences suggest that the ACS-NSQIP may be well suited for hospital benchmarking using thyroidectomy-specific outcomes. Current ACS-NSQIP data used for risk adjustment provides adequate distinctions of quality when profiling hospitals by thyroidectomy-specific and traditional outcomes. Routine prescription of calcium and vitamin D supplementation and use of energy devices and IONM were associated with differences in hospital performance, warranting further investigation. Corresponding Author: Jason Liu, MD, MS, American College of Surgeons, 633 N St Clair St, 22nd Floor, Chicago, IL 60611 (jliu@facs.org). Accepted for Publication: July 25, 2017. Author Contributions: Dr Liu had full access to all the data in the study and takes responsibility for the integrity of the data and the accuracy of the data analysis. Study concept and design: J. Liu, Ko, Hall. Drafting of the manuscript: J. Liu, Hall. Critical revision of the manuscript for important intellectual content: Sosa, Grogan, Y. Liu, Cohen, Ko, Hall. Statistical analysis: J. Liu, Y. Liu, Cohen, Hall. Study supervision: Sosa, Grogan, Cohen, Ko, Hall. Conflict of Interest Disclosures: Dr Liu reported receiving support from a research fellowship from the University of Chicago Medicine, under the auspices of Jeffrey B. Matthews, MD, and the American College of Surgeons Clinical Scholar in Residence Program. Dr Sosa reported being a member of the Data Monitoring Committee of the Medullary Thyroid Cancer Consortium Registry, supported by Novo Nordisk, GlaxoSmithKline, Astra Zeneca, and Eli Lilly and Company. No other disclosures were reported.